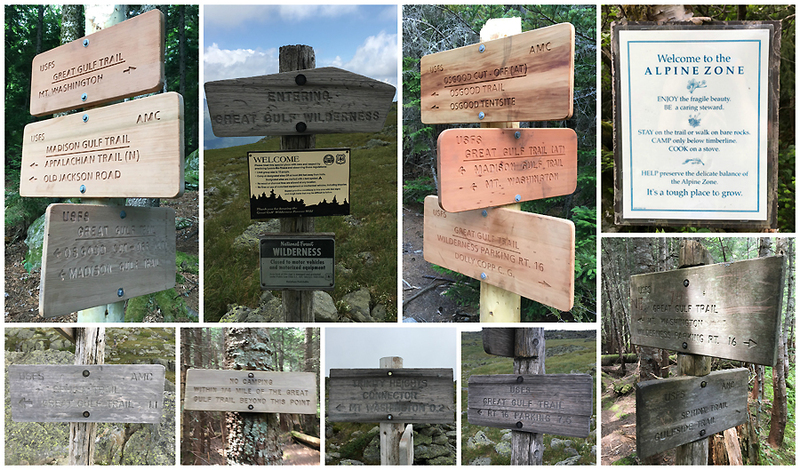 - Saturday morning I ventured into the Great Gulf Wilderness to hike Mount Washington the long, rugged, and secluded way, up the Great Gulf headwall. - The hike has easy to moderate grades with mostly decent footing for most of the first five miles to the Six Husbands - Wamsutta Trail junction. From here the grade remains the same but the footing becomes more rugged as the Great Gulf Trail passes the Sphinx Trail junction until eventually making its way to Spaulding Lake, which at around 4,200 feet in elevation is higher than most mountains, think about that next time you venture to the lake and stare up at the headwall that looms large right above your head, while you may feel like your at the bottom of a valley, you're actually higher than the summit of Mount Moriah across the way at the top of the notch! - From Spaulding Lake the real fun begins, first the trail becomes a flooded stream for a hundred feet or so, then it makes a slight turn off the brook part into an overgrown tunnel, taking on an abandoned trail feel to it for a hundred feet or so too, the footing is a worn path but everything is grown in and hanging into the trail meaning your feet disappear beneath you. Finally, after pushing through the overgrown section it opens back up as you pass the Alpine Zone sign. Although the trail is still narrow, it is obvious as it makes its way through the scrub and into the open at the bottom of the headwall. - The bottom part of the headwall has the trail snaking up through moss covered boulders, through on and off running water spots, all the while the steepness intensifies. It's a really wild section, very remote, with some tricky spots to maneuver around that are very wet and slippery. - Once past the bottom section, the headwall opens up even more and heads through a steep loose boulder field, made even more trickier after the Tropical Storm Irene rock slide came rumbling through part of the trail. Care must be taken to stay on the trail, as yellow blazes are few and far between, however there are well placed cairns up the headwall to help with navigation, they are small cairns but more than there were before. - The final section of the headwall, above the slide, is easier to follow as the yellow blazes become easier to spot. Above the slide the trail follows the boulder field mostly on the right side, closer to the rock and slab covered in vegetation. So if you don't see any blazes you're probably off trail too far to the left where there are bigger boulders, which I have done before, so angle your way back over to the right and look for the faded yellow blazes, or just continue on up to the top and then make your way over to the trail. - The Great Gulf Trail pops up above the headwall less than half a mile from the summit and a few hundred feet from the Cog Railroad...quiet time is over! On this morning I saw no one for almost seven miles, then I saw about fifty in a half mile! - I followed the conga line to the top, quickly refilled my water, and scurried off the summit cone away from the crowds, well most of the crowds as the Gulfside Trail around Mount Clay was a zoo too! - Finally, as I made it to the Sphinx Trail and dropped back down off the ridge it was quiet again. The Sphinx Trail is my adopted trail, on this day I was taking a quick pass through taking notes on future trail work needed to be done. There's about a half dozen leaners to clear, two big blowdowns to remove, a few water bars to clean up, some minor brushing back, and one trouble spot where hikers wander off trail at a sharp right water crossing right above the start of a narrow gorge where the cascades start, about five hours worth of work to do! - Once back to the floor of the Great Gulf I made the long hike back to NH16, crossing paths with a few hikers, backpackers, and a ranger. - If you are looking for a challenging hike that is away from the crowds and an adventure, head deep into the Great Gulf and you will not be disappointed! The Great Gulf Trail involves a lot of walking in the woods, mostly along the West Branch of the Peabody River. Right after the lake the trail turns into this, a brook and a tunnel, let the fun begin! Always enjoy this spot with the two huge boulders on each side, like passing through a checkpoint! The train coming up and hikers everywhere out and about. Notice most of them trudging through the alpine zone off trail, unfortunately this happens a lot in the summer when uninformed hikers hike the rock pile. The Cog Train makes its way along Jacob's Ladder with Mount Monroe, Franklin, and Eisenhower behind it. Thanks, David. Definitely hike it if you have good weather, it would be a blast in the fall! Awesome trip report as always. I really need to hike the Great Gulf trail this year. The picture with the hikers is sad though not to uncommon, I saw on top of Eisenhower. Hope you get up in there this year, Matt! I hear ya, Mount Eisenhower summit is one of the worst spots, I always see people just roaming around up there too.